KARACHI, April 19: The civil judge and judicial magistrate-X, south, on Saturday remanded Agha Javed Pathan in judicial custody till April 24. He was booked on charges of manhandling former Sindh Chief Minister Dr Arbab Ghulam Rahim and possessing illegal weapons, hashish and a stolen motorcycle on April 9. Three cases (FIR Nos 199/2008, 200/2008 and 201/2008) were registered against him under Sections 337-A, 392 of the Pakistan Penal Code, 13-D of the Arms Ordinance and Section 6/9-A of Control of Narcotic Substance Act at Preedy police station. In yet another case pertaining to robbery, Agha Javed Pathan was remanded in judical custody till April 24 by the judicial magistrate-I, south. The case was registered at Preedy police station under Section 395 of the PPC. Mr Pathan told the media that he was a worker of the Pakistan People’s Party and had also met Asif Zardari. “I have played an important role in the election campaigns of PPP candidates, while the police are trying to affiliate me with PPP (SB), Arbab Rahim and Imtiaz Shaikh,” he said and alleged that fake cases had been lodged against him at Preedy police station. 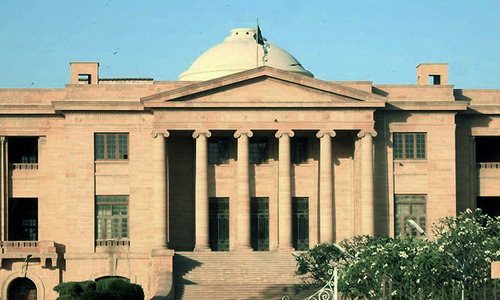 The special judge of the anti-corruption court, Karachi, Syed Gul Munir Shah, has adjourned the hearing of a corruption case against the officials of the market committee of the Sabzi Mandi till May 10 due to the absence of the prosecutor. The accused are facing charges in the land scam that involved millions of rupees.